nv Vilmart & Cie. Cuvee Rubis, Premier Cru Brut Rosé Champagne, a Rilly la Montagne, France. When you think about luxurious Champagne, Vilmart comes to mind and should, these are some of the most beautiful and thrilling wines in the region, there’s no question in my mind Laurent Champs (at Vilmart) is one of the best producers of sparkling wine in the world, and tasting a wine like this Cuvee Rubis is proof. Vilmart & Cie., founded back in 1890, has always been a récoltant-manipulant, or a grower producer, making their Champagne exclusively from estate-owned vines, which is all grown using organic viticulture and exceptionally low yields. Vilmart, since 1989, has been in the hands of Laurent Champs, the fifth generation of the family to head the estate and has truly brought this Champagne house to the highest level, right up there with the famous Krug! Like Krug and Dom. 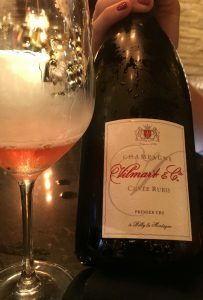 Vilmart makes age worthy vintage Champagne, but while the vintage stuff needs a few years under cork to show their best Champs’ non vintage offerings are gorgeous on release, showing opulence, vitality and depth. This is especially true with his latest disgorgement of Cuvee Rubis Brut Rosé with it’s bright red berry notes, creamy mousse and decedent body, it’s a stunning wine of class and exotic in character. This Rubis, with mostly Pinot Noir is a blend of, or a Cépages of 90 % Pinot Noir and 10% Chardonnay made from an assemblage of vintages: 2013-2014, coming from two sites, vineyard/Villages with grapes sourced from estate plots in Rilly la Montagne 1er Cru and Villers Allerand 1er Cru, both outstanding Premier Crus, with the elevage in oak casks with no malos. This edition, beautifully pink/salmon/magenta in the glass, is one of the best I’ve tried with lovely perfume, vitality and a hedonistic vinous mouth feel as well as a gracious generous presence in the glass, while still having a tight focus and firm structure, this is a Brut Rosé Champagne that has the wow factor and far and away blows past expectations, this is beautiful, beautiful grower fizz! Layer upon layer of elegance with stunning form from start to finish, with seductive violets, cassis, strawberry, cherry and pink citrus leading the way on the wonderfully vivid palate along with hints of baking spice, mineral tones, brioche, along with a studied play, or tension between creamy toasty roundness and vibrancy, transparency and detail. Vilmart promises a good time with every bottle and while stellar on their own, they happily will take center stage, but they are amazing food wines too, best to enjoy with matching cuisine, I can’t think of many better ways to celebrate life and friendship than with a bottle of Vilmart, in particular their Brut Rosé Champagne(s) like this one.